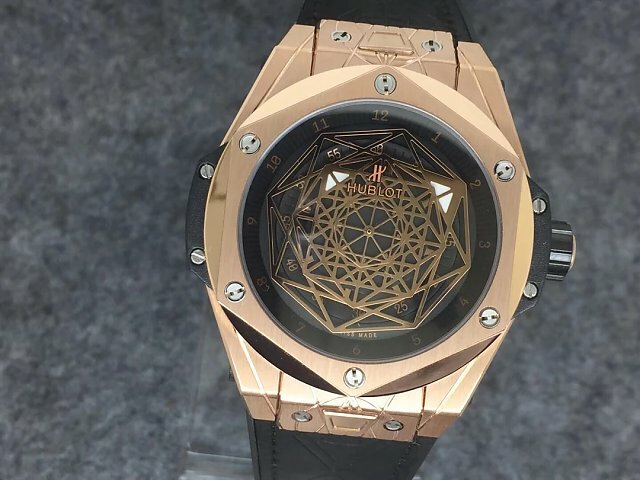 It can be said that Hublot is the most successful sports watch brand in recent years, Hublot has occupied a large watch market share through their unique watch design and marketing strategy. 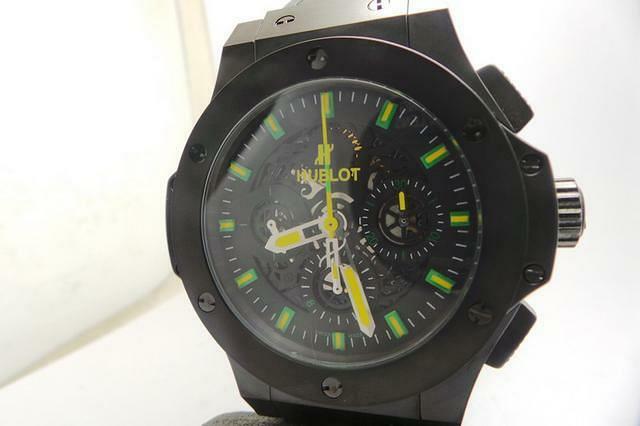 So Hublot also becomes one of the mostly replicated watch brand that is next to Rolex and Panerai. 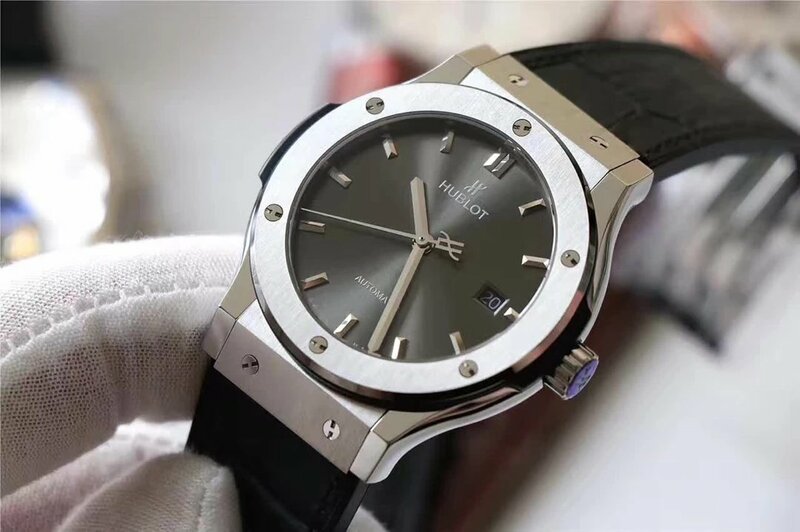 Because of fusion watch material use, genuine Hublot watches are sold at very high prices, so a lot of watch fans turn to buy replicas. 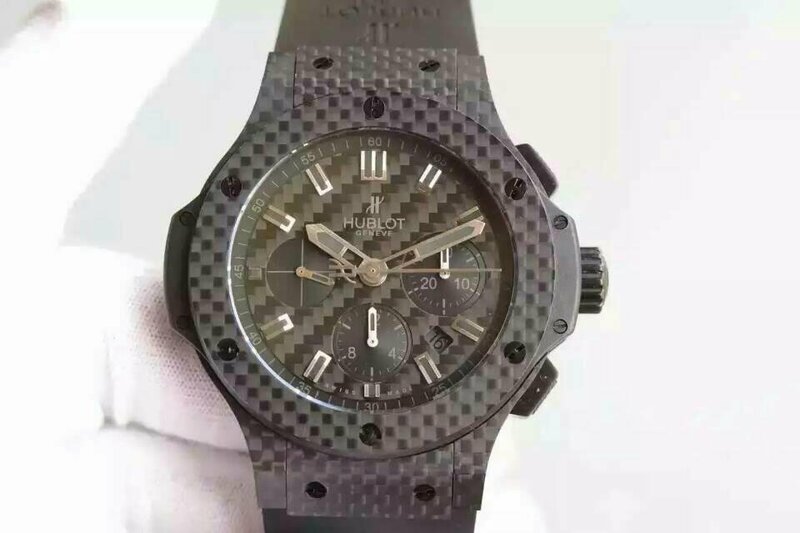 In our market, there are lots of good quality Hublot replica watches that are made by several big factories such as JJ, V6 and so on. 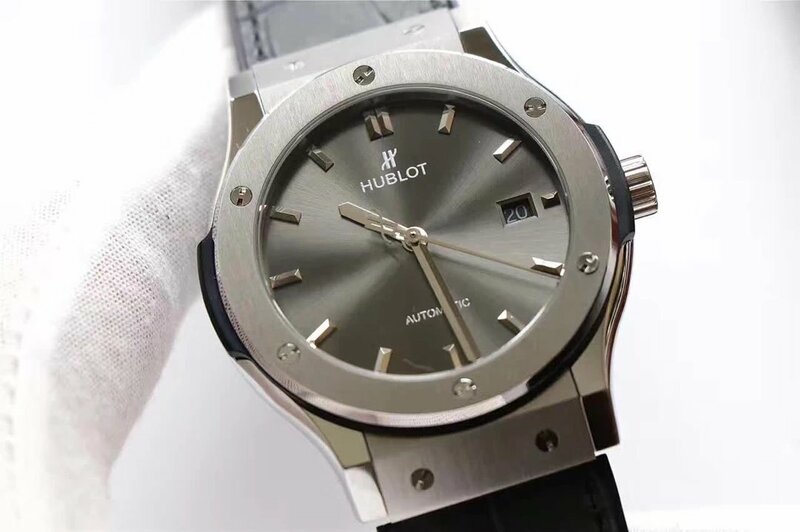 With good quality watch material and high watch-making technology, now you can not tell the difference between a replica Hublot watch and the genuine model. 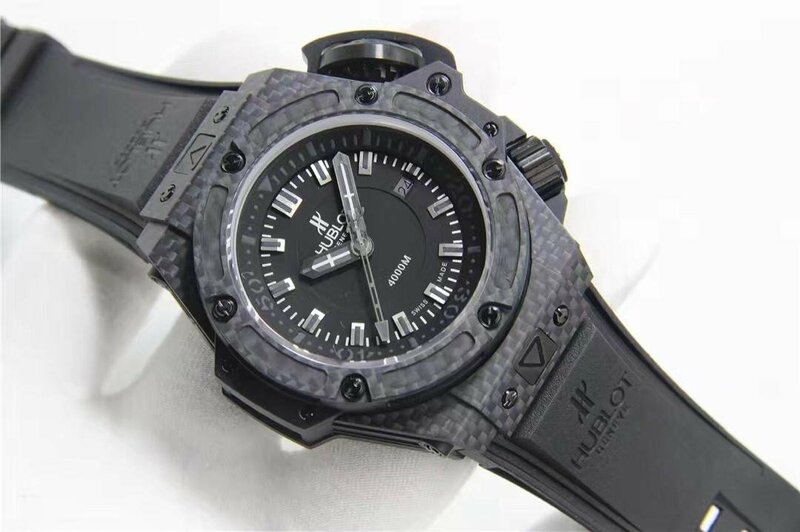 In the following, I am going to introduce such a replica watch, it is Hublot Classic Fusion with Titanium case. Let the specification come first. 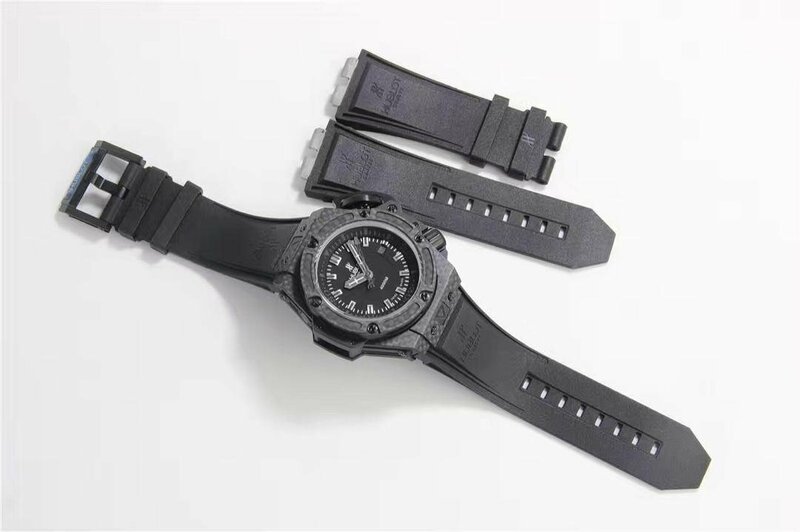 The case is made of solid Titanium, so the watch feels light in weight and is more comfortable to wear. 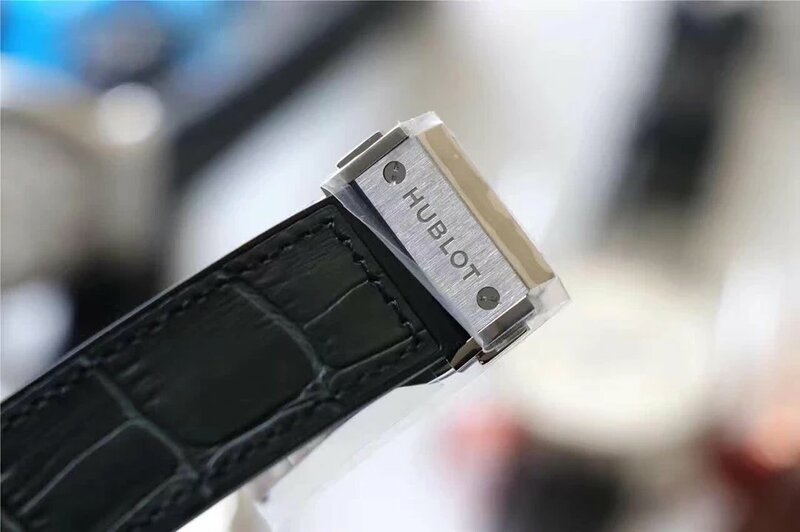 Hublot has an unique case shape, with H-shaped screws fixed on case and bezel. 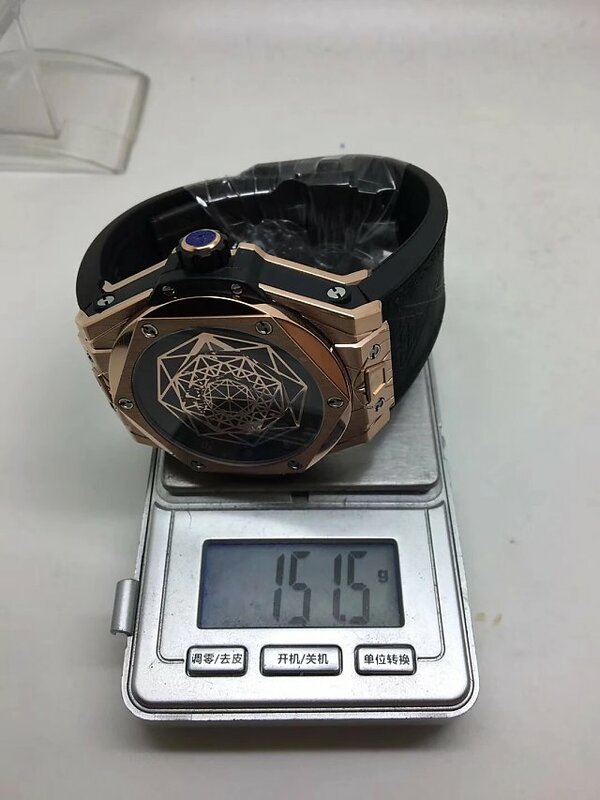 Crown included, the case is measured to be 42mm in diameter, and the replica is 9.85mm thick, genuine is 9.8mm in thickness, while the difference could be ignored. 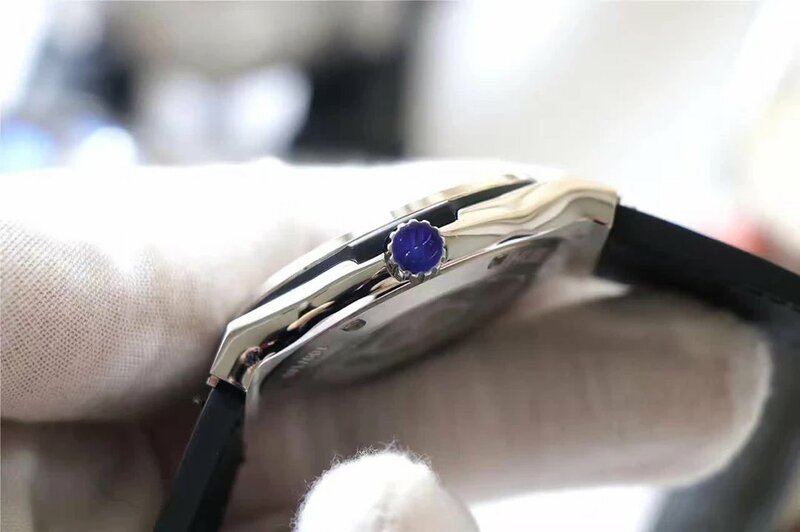 The case polishing is in high-level, the use of brush and polish brings a layered sense in visual effect. 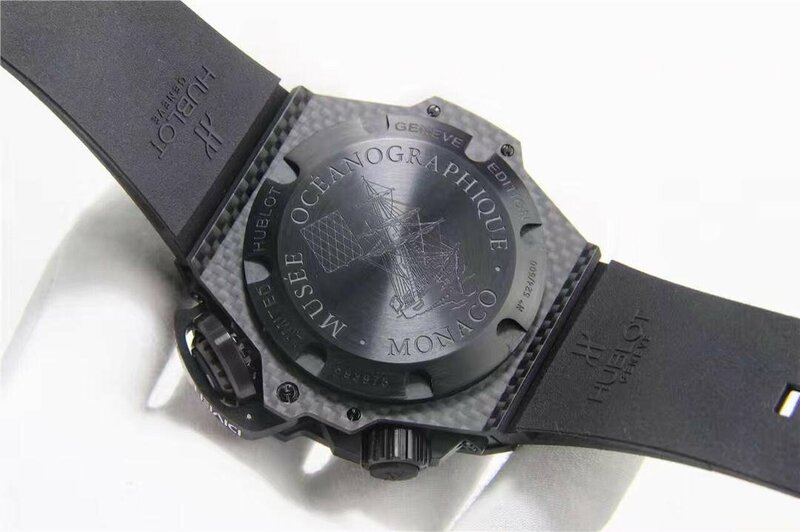 On case back, the engravings have a high replicating level and make you can not believe it is a replica. 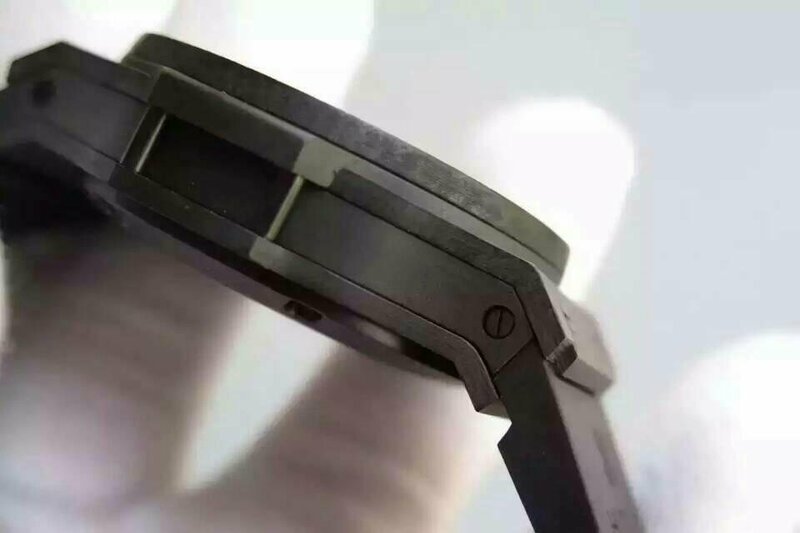 On the metal part that connects case and band, you can clearly see “Titanium” word engraving, the genuine also has this feature. 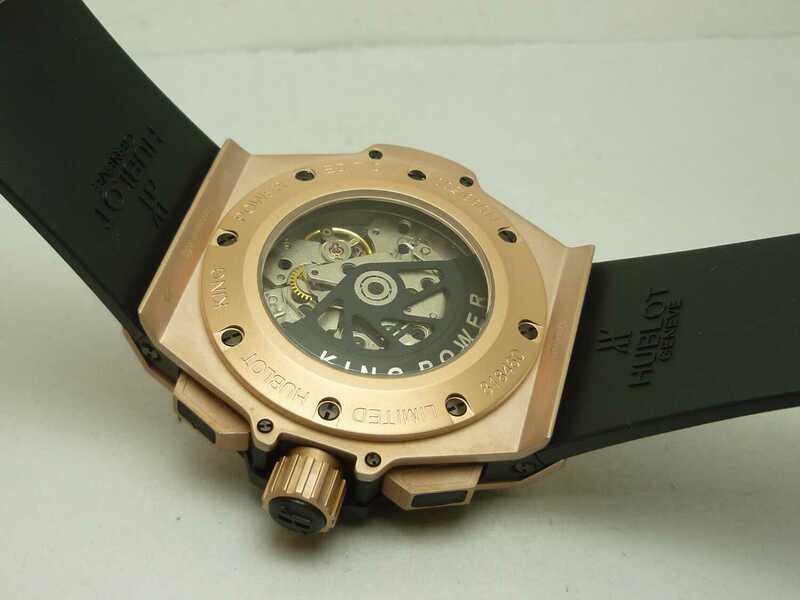 From pictures below, you can see the crown on replica has the same grooves and chamfer as genuine. 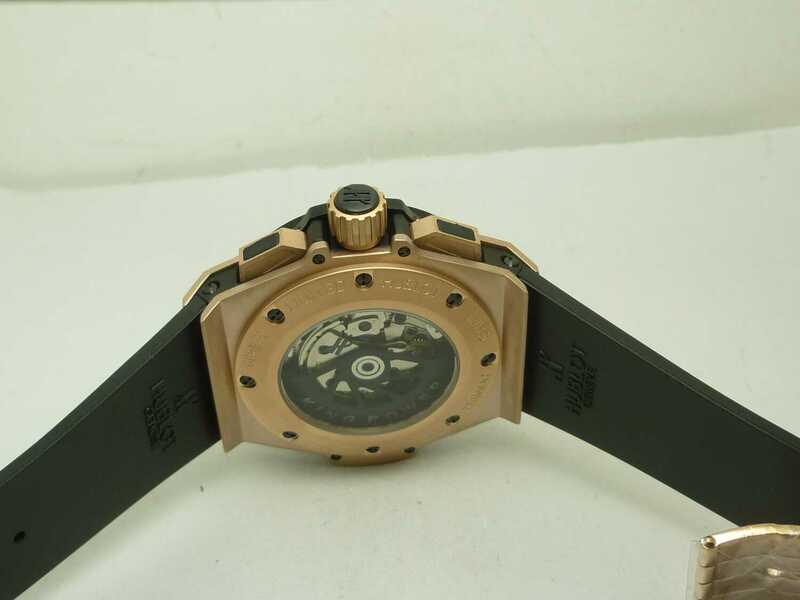 Crown is important, while after being tested by JJ factory, the crown, tube and other crown parts on this replica Hublot could be interchanged with genuine watch. 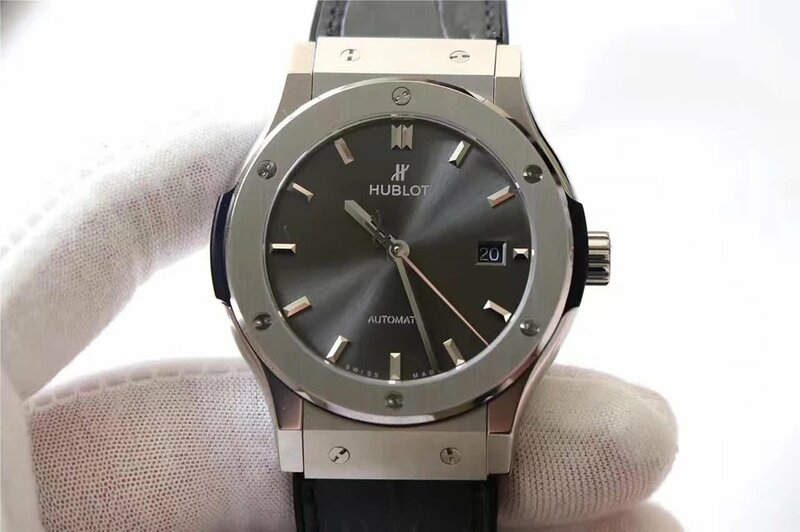 Dial is in grey and looks very simple, the slender and long second hand is sweeping the big dial smoothly. 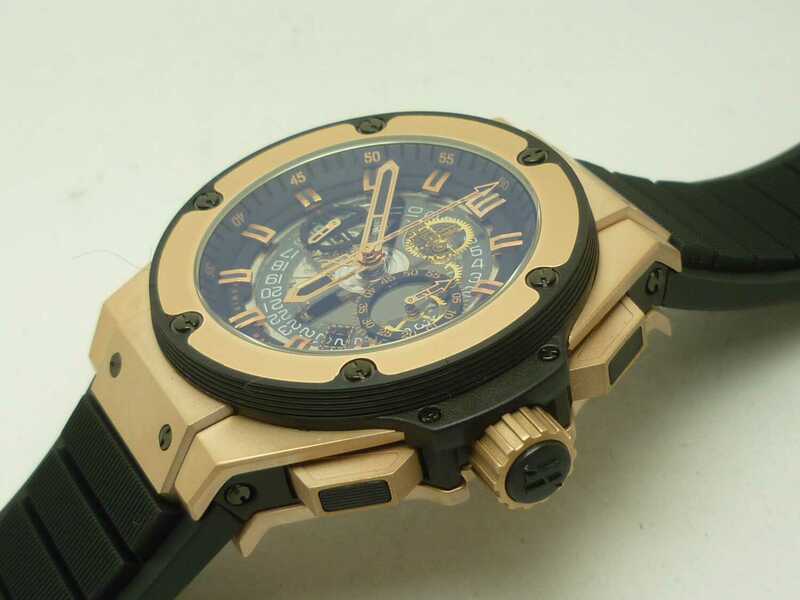 Hour markers, hour and minute hands are also moulded perfectly, so they look more like the genuine. 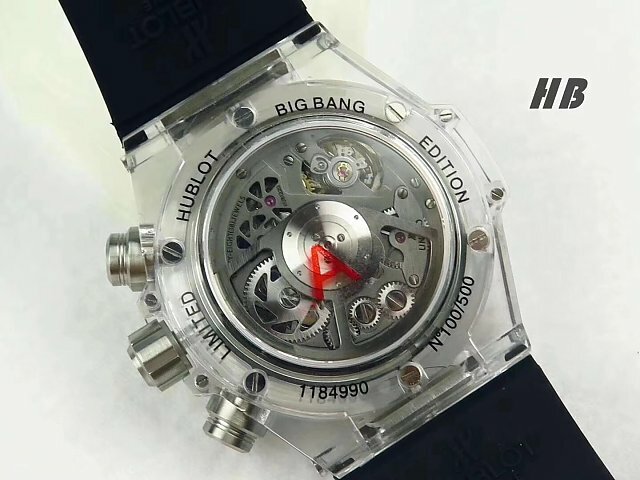 Genuine watch uses HUB1112 movement, actually is SW300 movement produced by Swiss ETA. 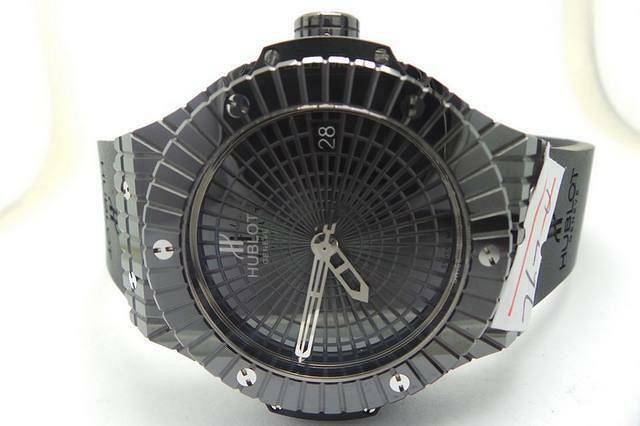 While this replica Hublot Classic Fusion ie equipped with a clone HUB1112 that is on basis of Swiss ETA 2892. 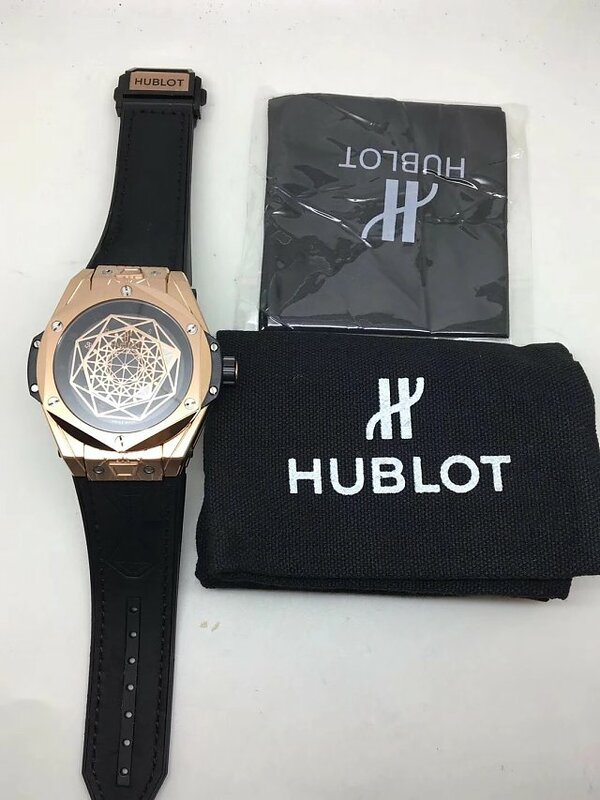 Geneva Stripes, HUBLOT LOGO and Movement Stamp(HUB11, SWISS, TWENTY-FIVE 25 JEWELS) are 99% close to genuine HUB1112, even a Hublot professional is hard to find the difference. 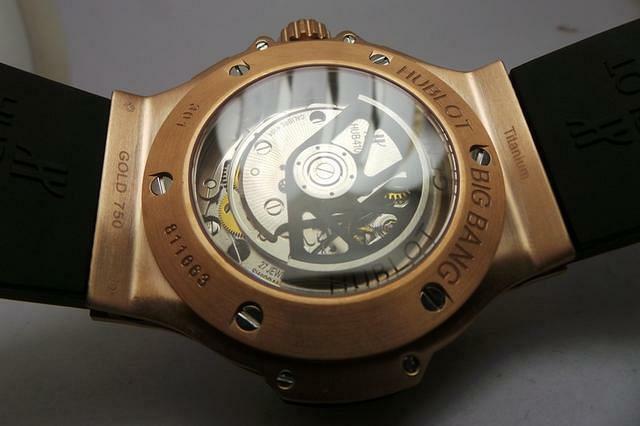 Most importantly, you can use the watch 42 hours after one-time full winding. 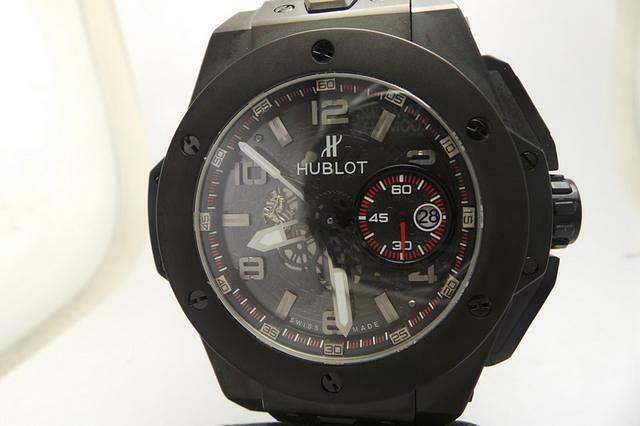 If you are finding a Hublot watch with simple outlook and functions, this replica is one of your best choices. 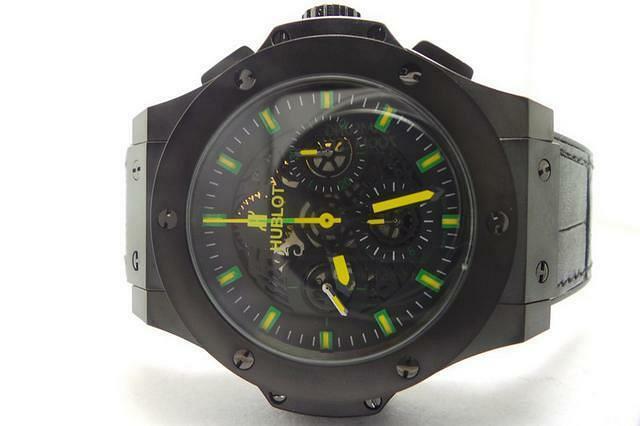 Today I am going to bring you a review on this huge piece – replica Hublot King Power 4000m. 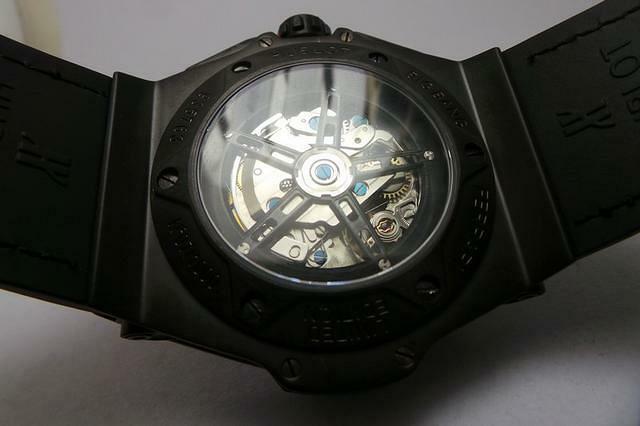 This black and cool watch looks very strong specially when I hold it in my hand. 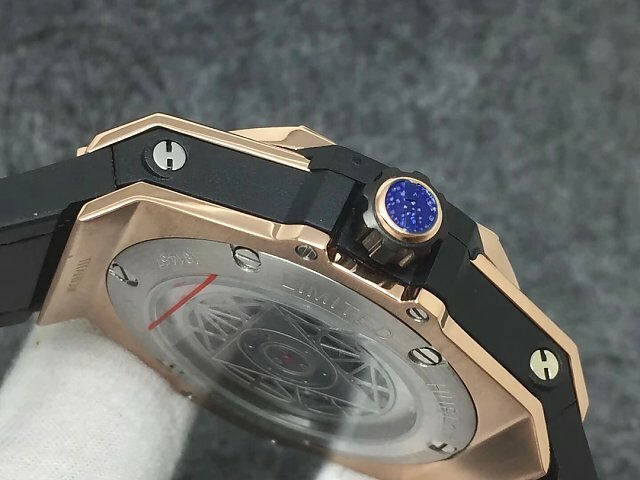 As strong it is, not everyone can handle this huge watch, I think this is for those strong and sport guys. 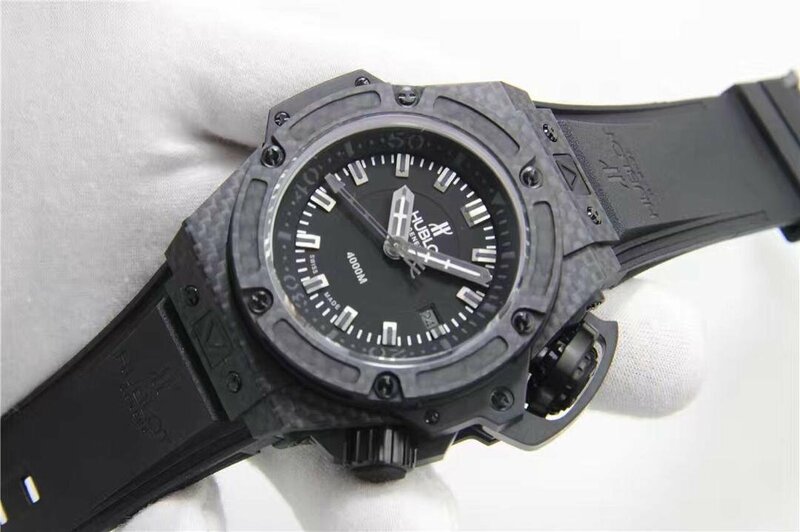 Strengths of this watch including new strong material, diving timing function and supper big case. 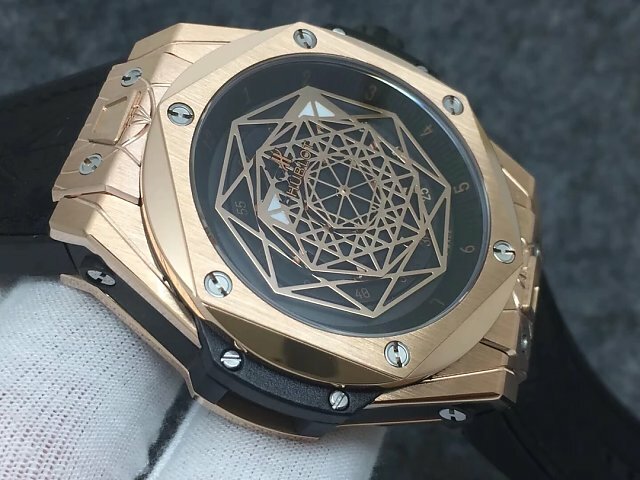 Let’s have a look at this fantastic watch. 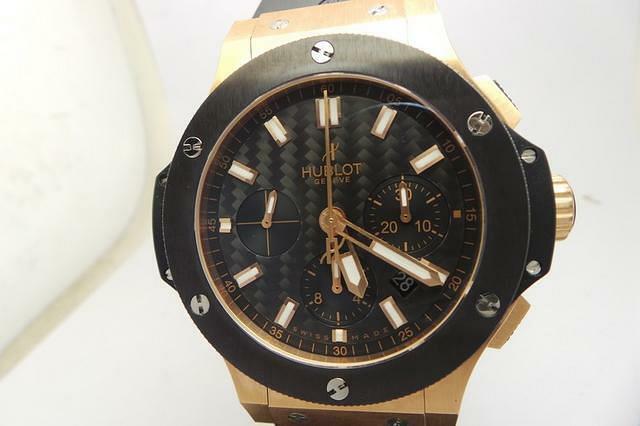 It is well-know that Hublot is good at using high-tech and new material. 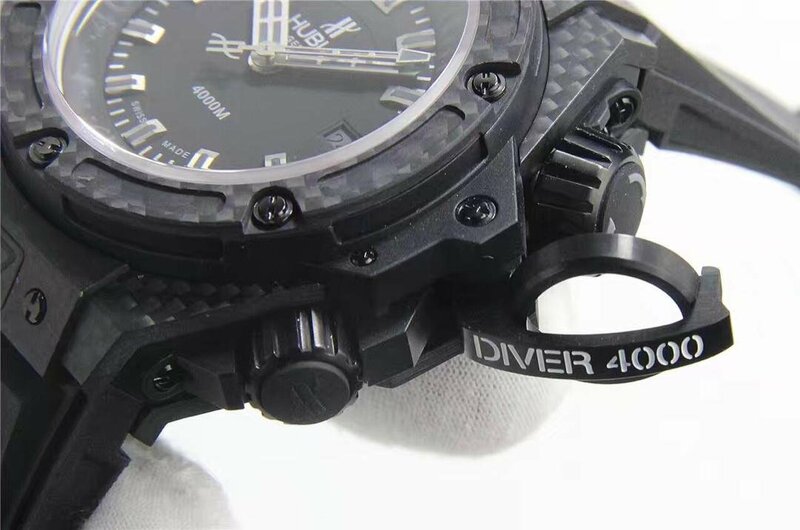 This large diving watch has a 48mm case, and the parts with patterns I can see is made of new forge carbon fiber material which is 8 times stronger than solid stainless steel. On the black dial, markers and needles are superlumed, which is a basic function for a diving watch. 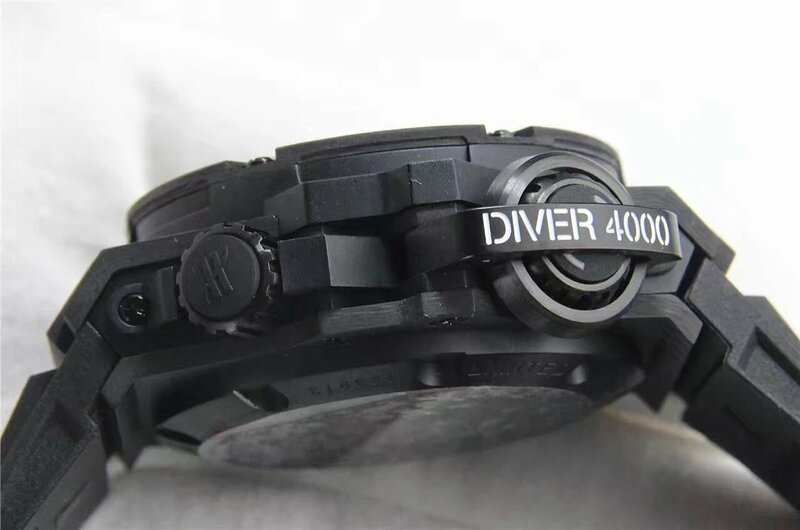 Come to the right side, there are two buttons, one is protected with a bridge and this is for adjust the timing while diving. 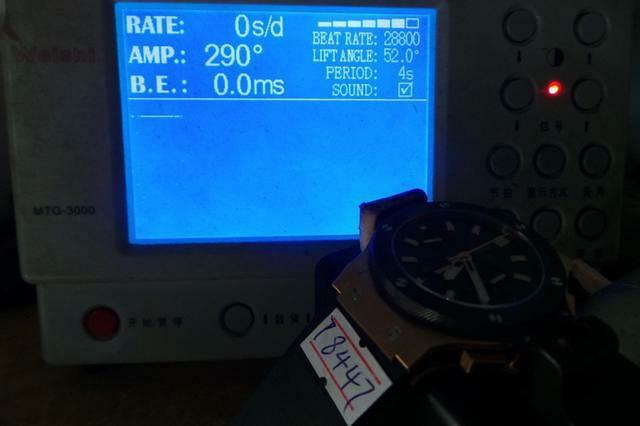 The one below is for adjusting the time. 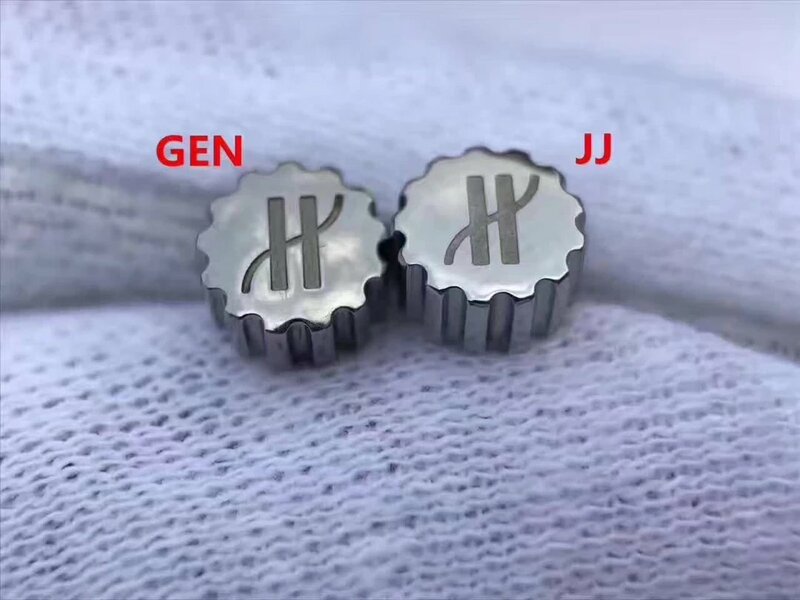 Both of two buttons are screw in type. 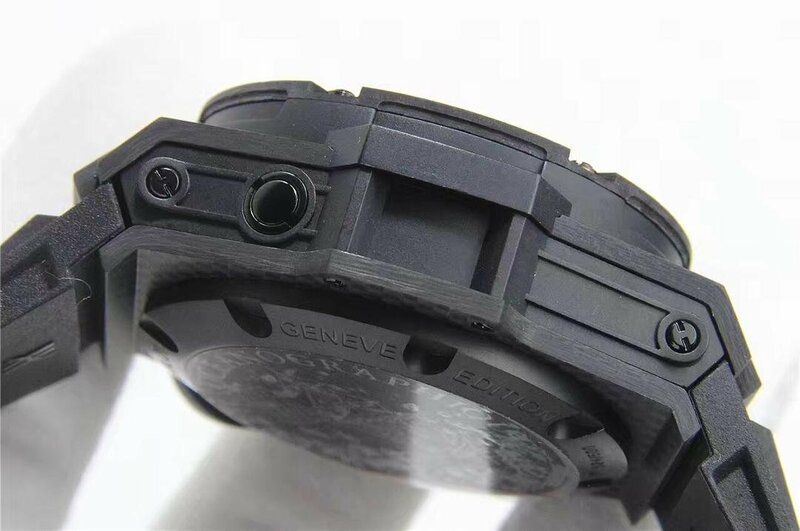 The protective bridge is made of rubber, and the buttons are made of metal with PVD coating. 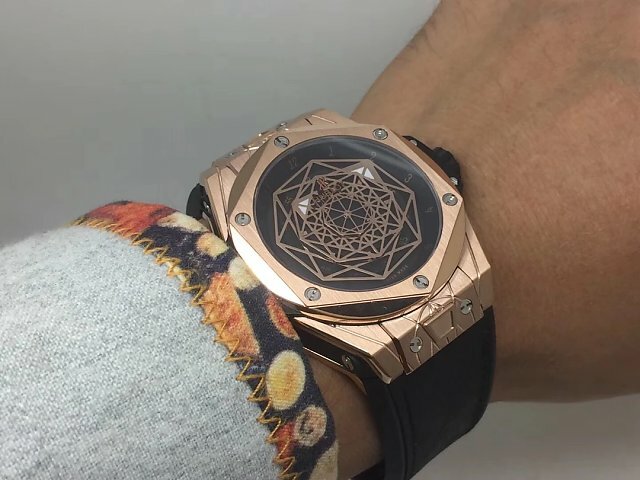 The front glass is made of sapphire crystal. 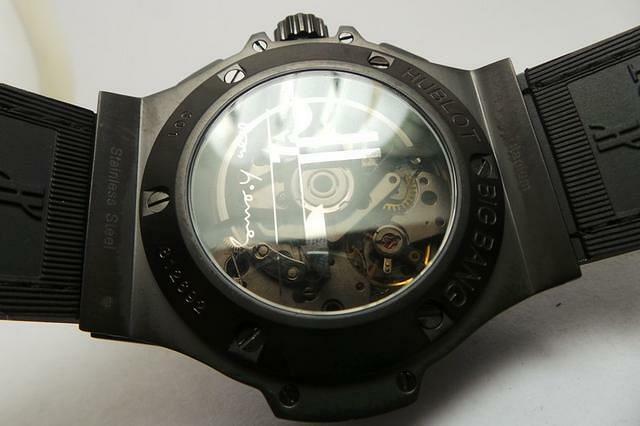 Inside its strong case, there is a Swiss made EAT2824 movement, very accurate and steady working heart. 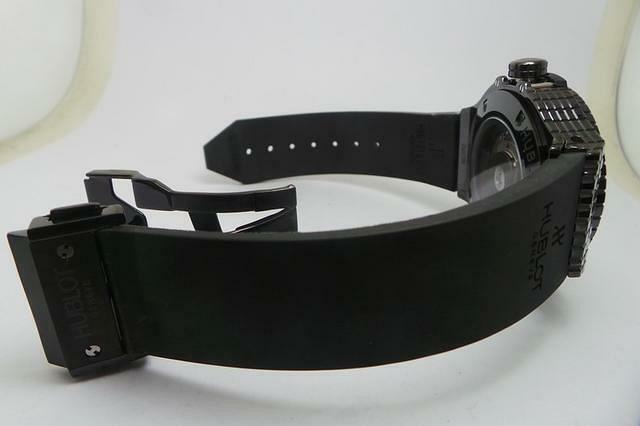 This ensures it can work as good as per original watch. 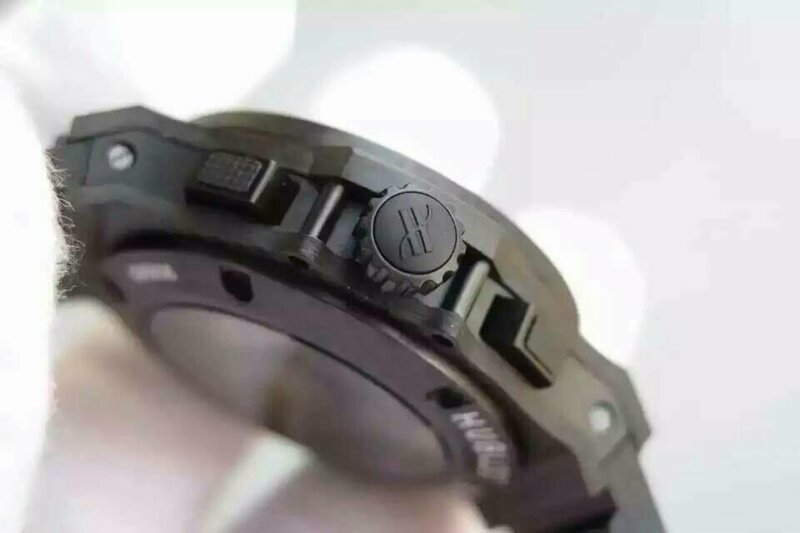 The back case is sealed and waterproof, and there is engraving logo and information on it. 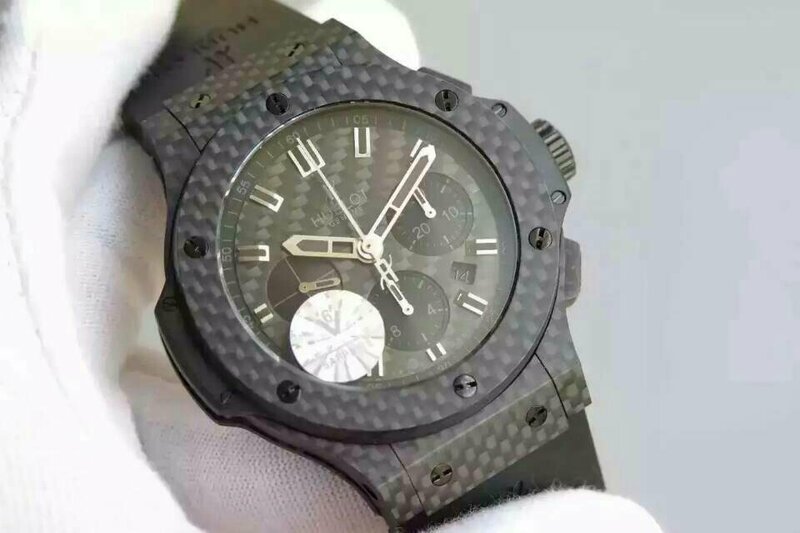 The bracelet is made of rubber, matching the carbon case perfectly. 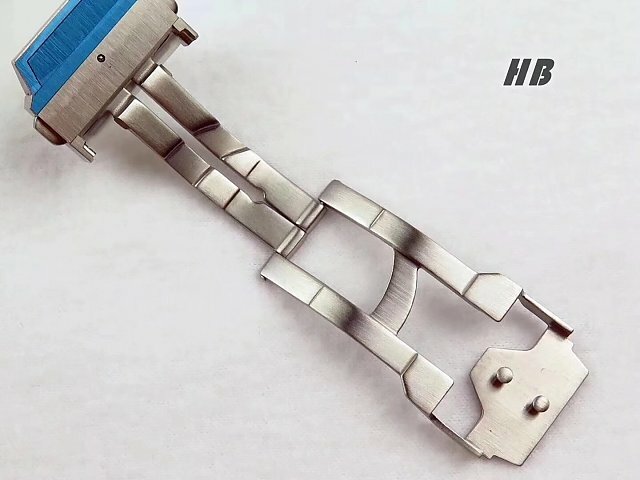 The bracelet can be moved easily and change it if necessary. 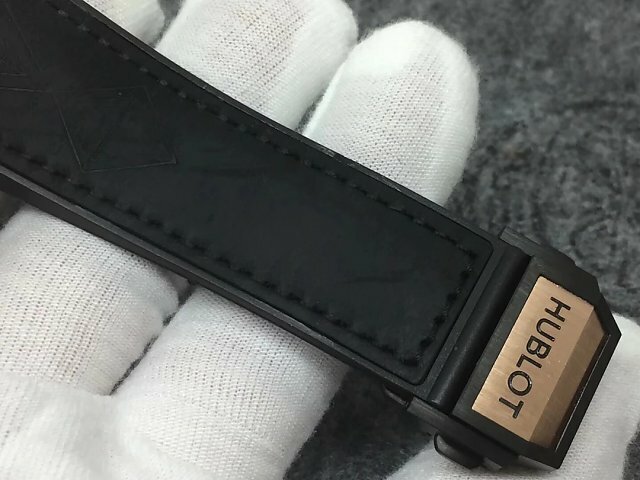 On the bracelet, there is Hublot’s name and logo, looks nice. 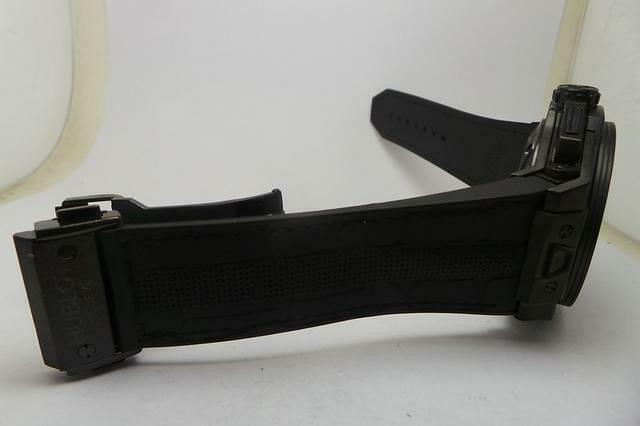 The clasp is a adjustable one just as other sport watch. 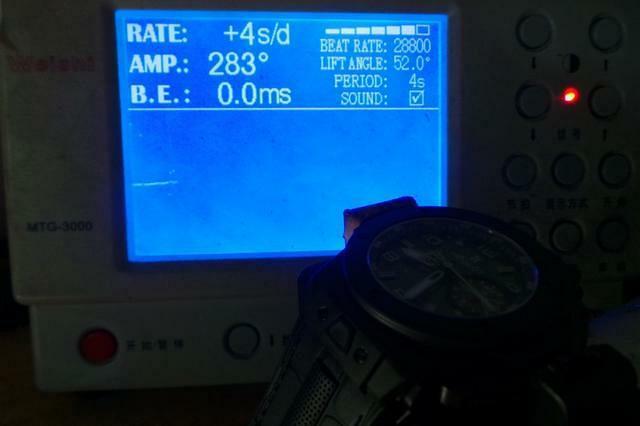 And, the waterproof function should not be worried about. 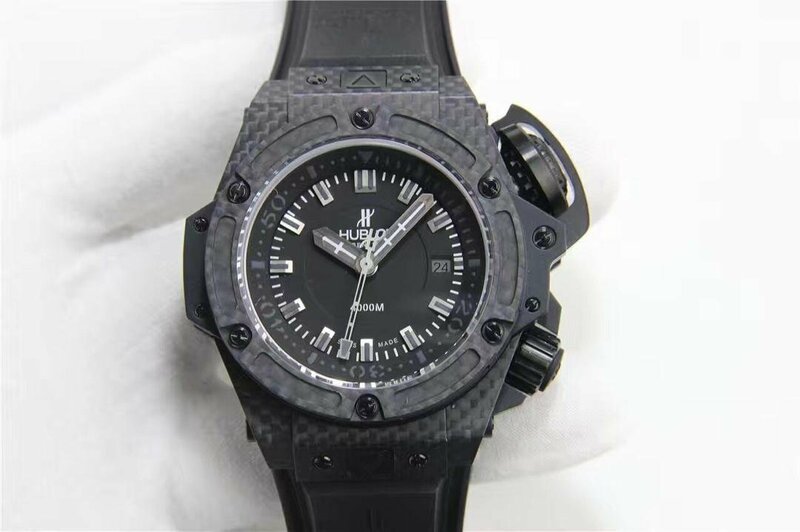 As I said at the first, this watch is not a right one for anyone, this watch would be a favorite watch for those strong and sport guys. 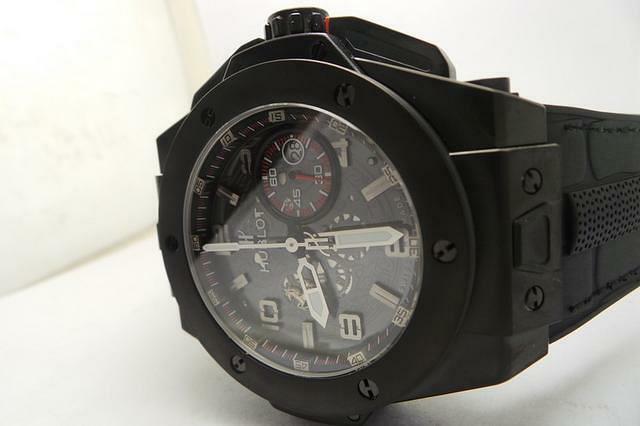 If you love sport watches, don’t miss it. 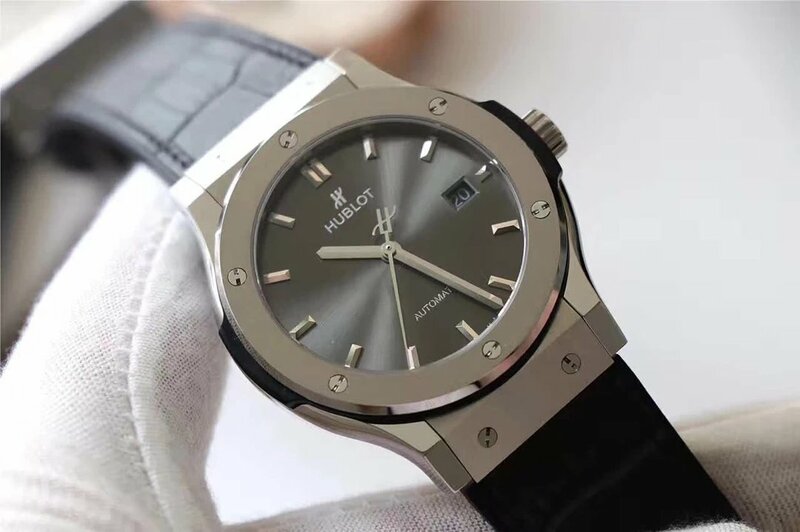 If you are looking for a very masculine watch for yourself or as a gift for a man, Hublot is always a good choice, and it have never been wrong. 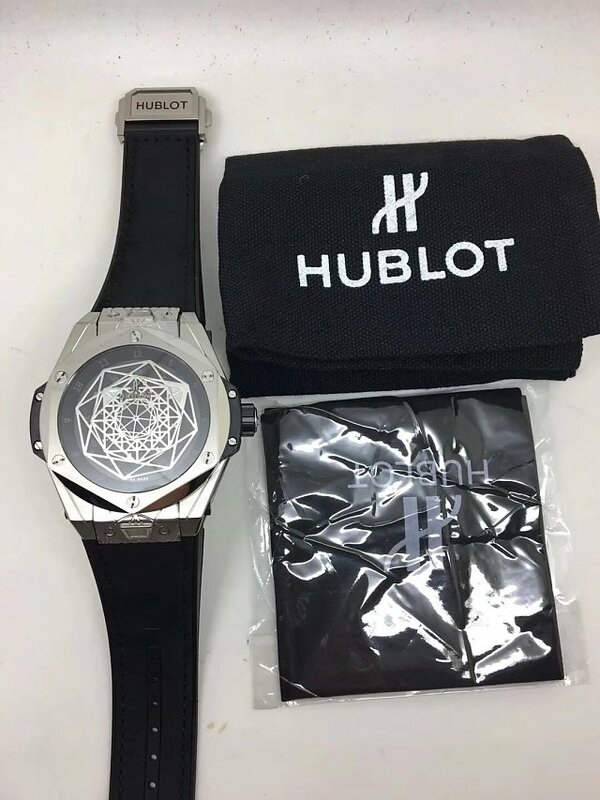 This new released replica Hublot King Power Unico watch is with a 48.5mm dial which is just a perfect size on men’s wrist. 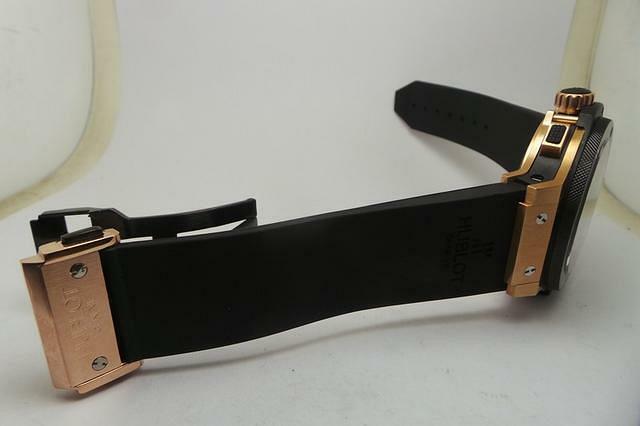 The black belt is perfect matching the case’s rose gold color, which would make a gentleman look so stylish and smart. 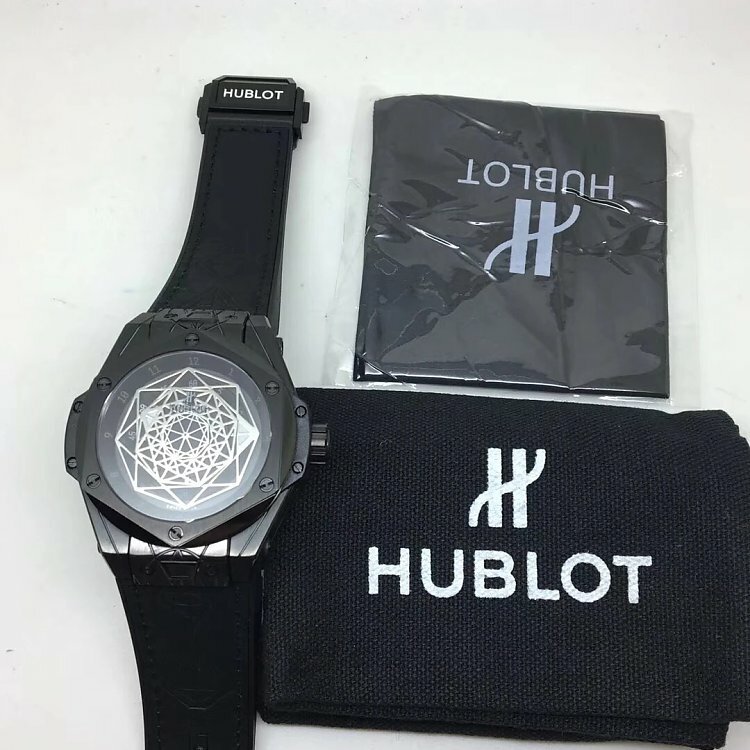 In addition, the sapphire crystal and double sided AR coated glass makes this replica Hublot King Power watch more amazing. 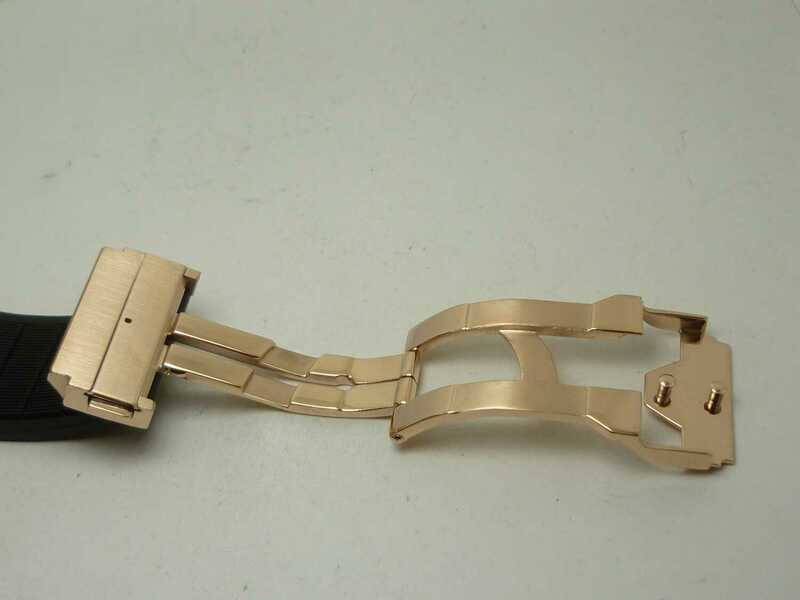 The deployant folding clasp is a very convenient design and the color is matching the belt perfectly. 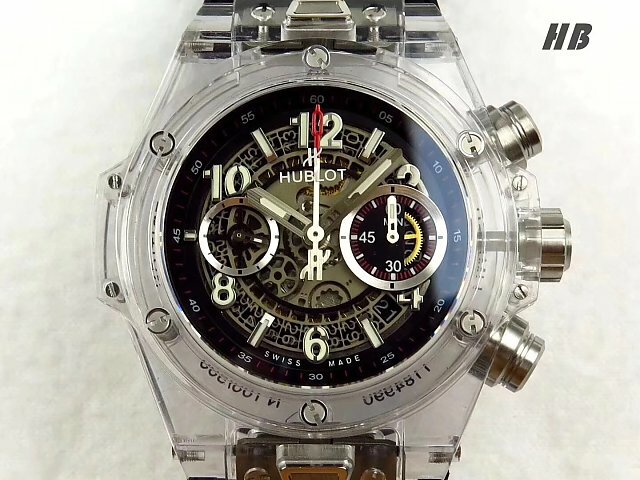 Definitely, replica Hublot Unico is so outstanding and attractive from its appearance. 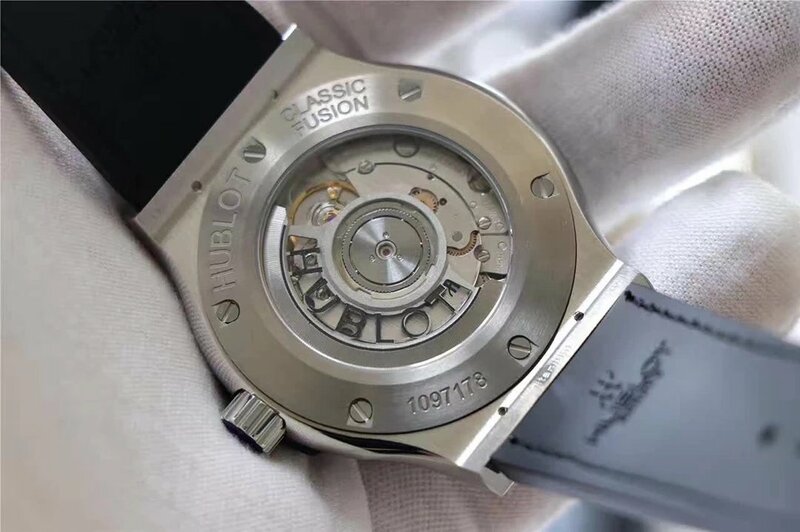 Now let’s have a look at the movement – Asian 7750 Valjoux Working Chronograph movement, 28800bph, Engraved Decorated Insignia Rotor, we can see this powerful and elegant part from the skeleton back. 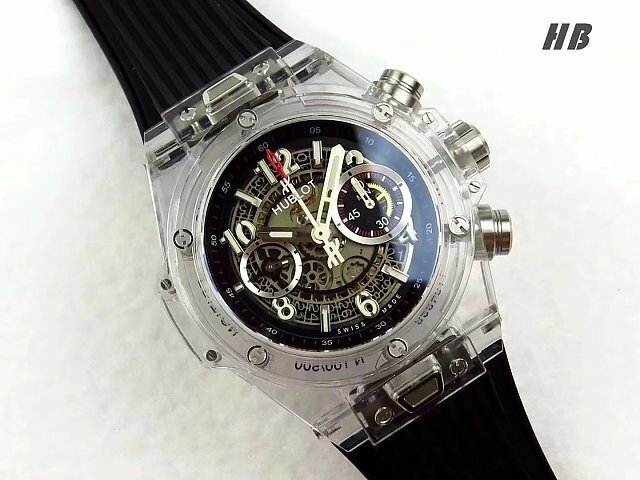 What’s more the skeleton design is also one of the specialty for this replica watch. 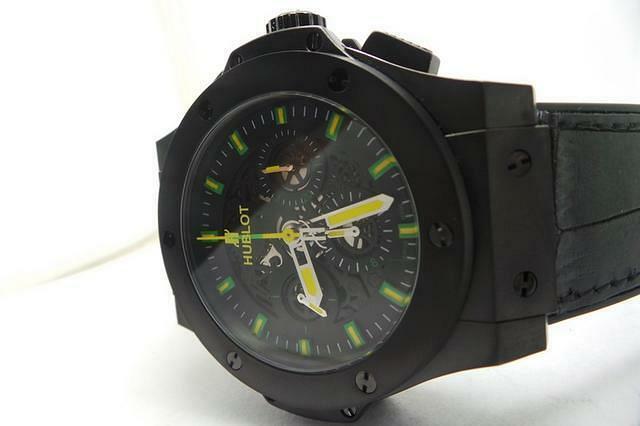 Replica Hublot King Power Unico is not only a great choice on its look but also a very practical watch on the function. 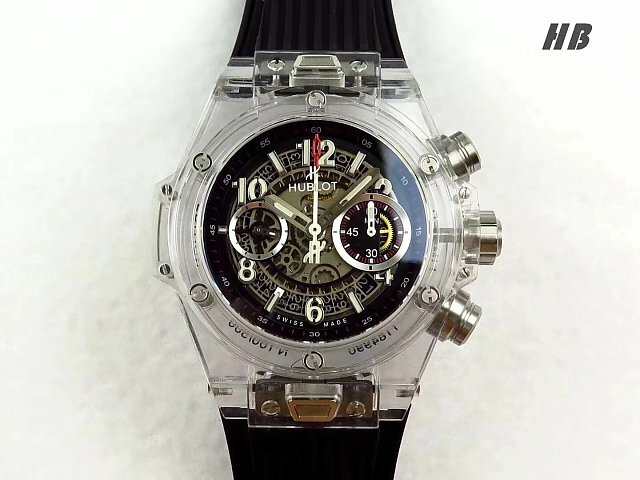 The functional parts are including Fully functional chronograph top pusher starts/stops chronograph and bottom pusher resets chronograph. 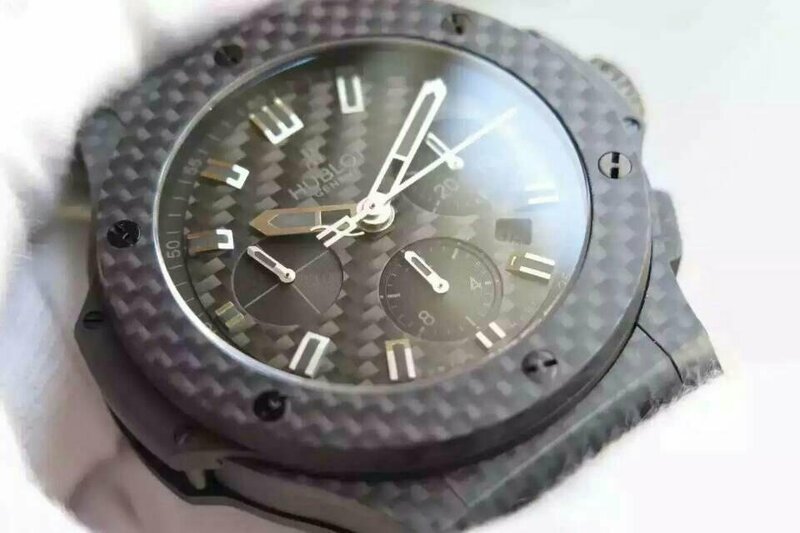 And the water proof structure and material make it an excellent watch for every gentleman. 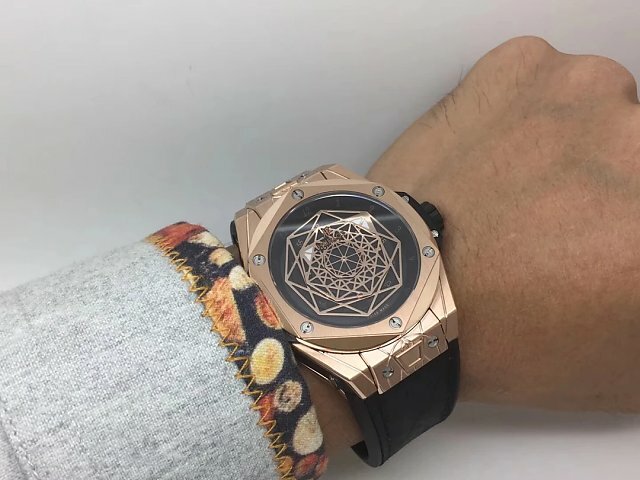 As I said at the first beginning, replica Hublot watch is always a nice choice, and this model – replica Hublot King Power Unico is one of the best choices. 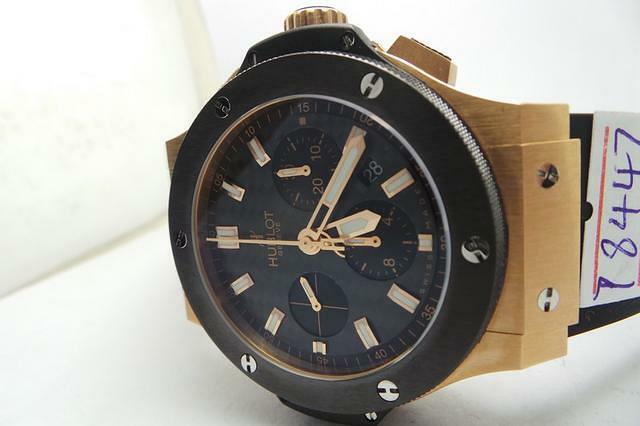 No matter the style, material or the function, it is a great piece of gift for every gentle. 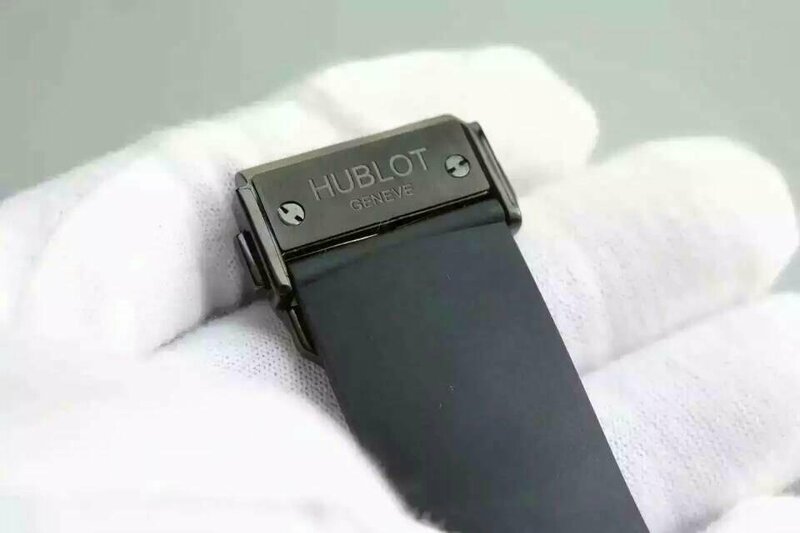 If you are a Hublot fan, this is a necessary one for you, if you are not, this is also a useful and elegant decoration on your wrist. 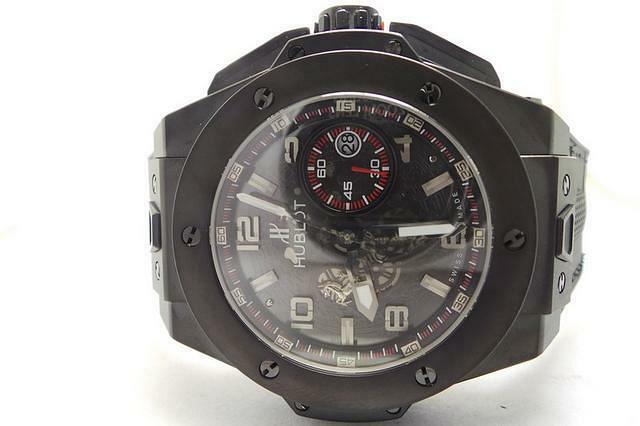 This Hublot deserves an owner with good taste and you deserve an amazing watch like this. 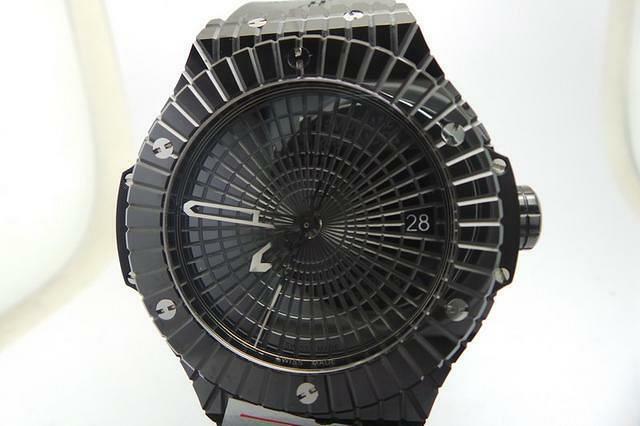 Hublot has launched the series of Aero Bang Niemeyer, which was for showing its respect to this great modern architect. Therefore, today I am going to recommend an excellent replica about this series which with memorable meaning. 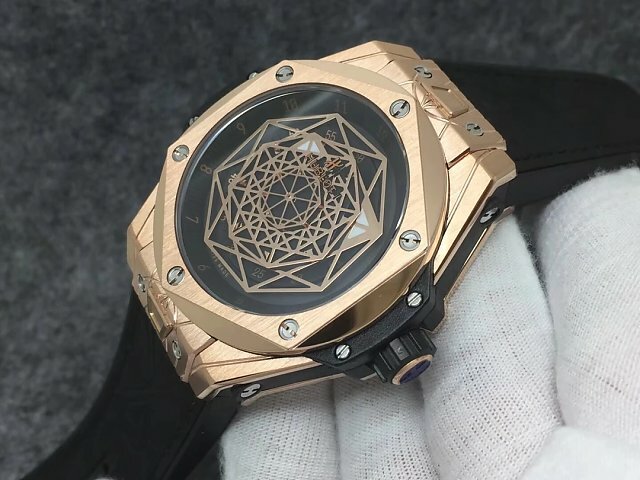 I believed that you may like such awesome replica. 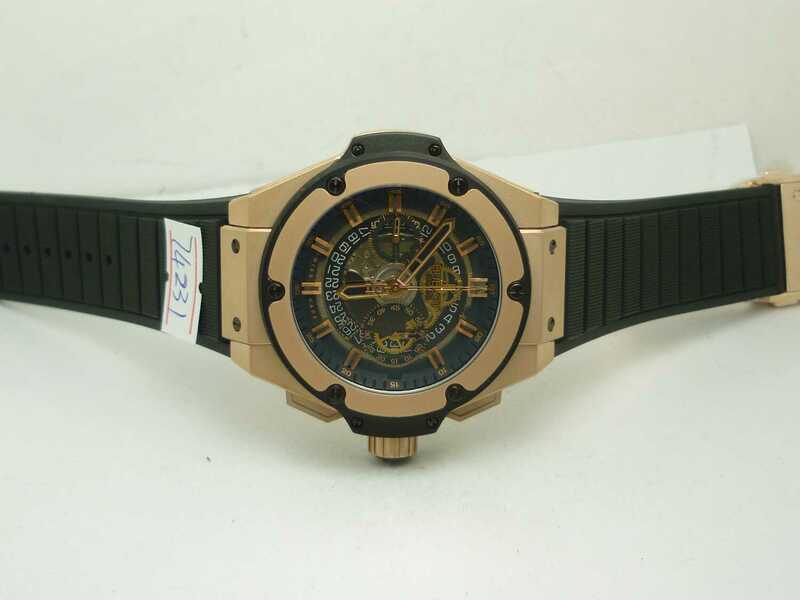 A good wrist watch should be have the beauty of machine and dynamic, what’s more, it should take balance between such two factors. But this replica really has done it smoothly. 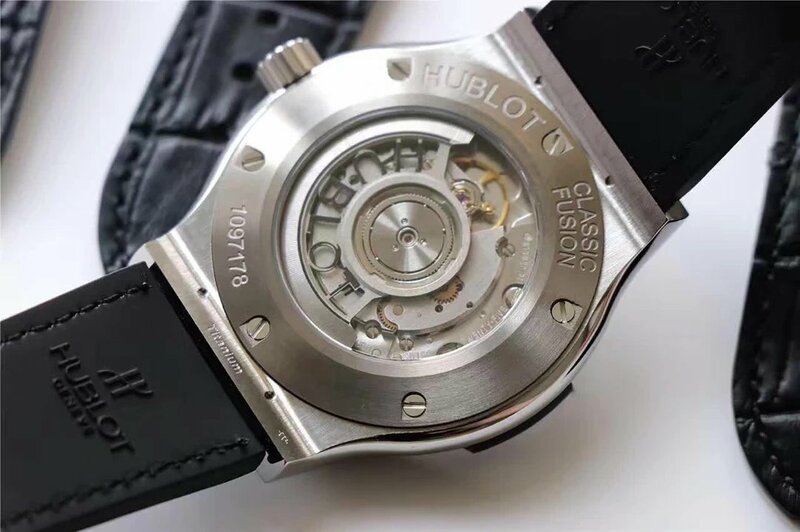 This replica with an inner case which was made of solid 316 stainless steel and its outer was covered with full brushed ceramic. 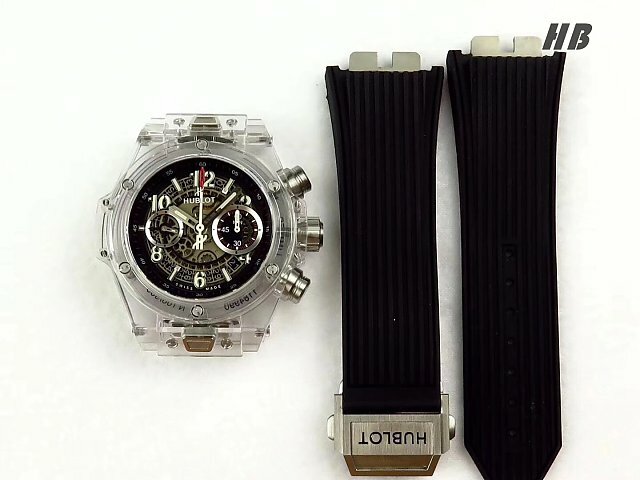 Mix with this two superior material, you don’t need to doubt its ability to be wear resistant. 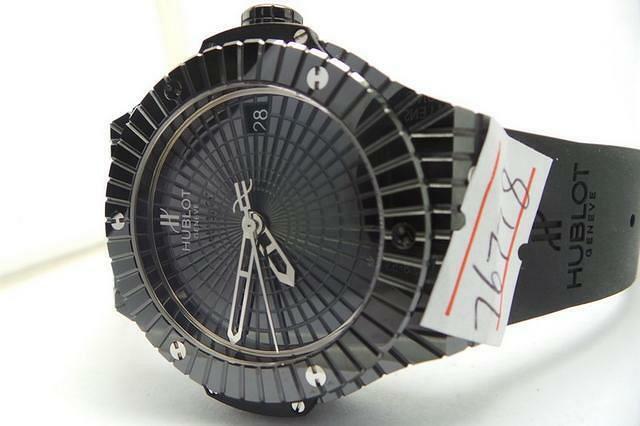 Through its sapphire crystal which with double AR to protect its dial effectively. 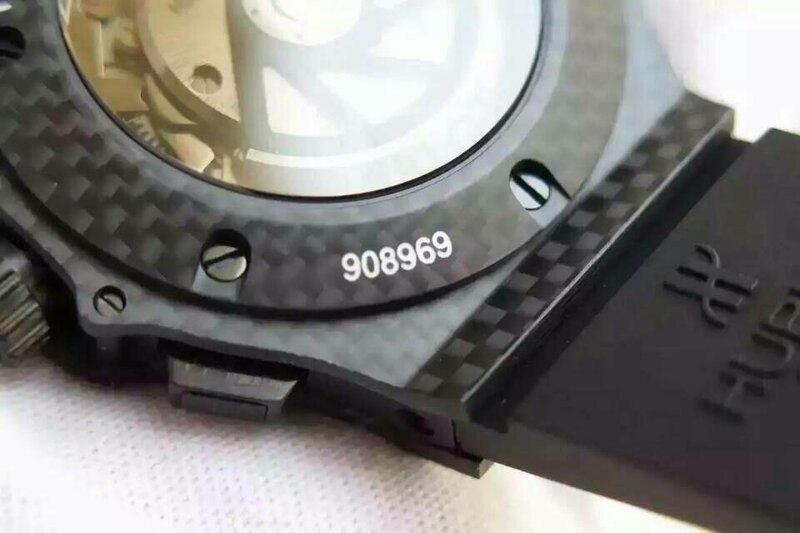 We can see that it has a black dial, along with green and yellow hands and markers. 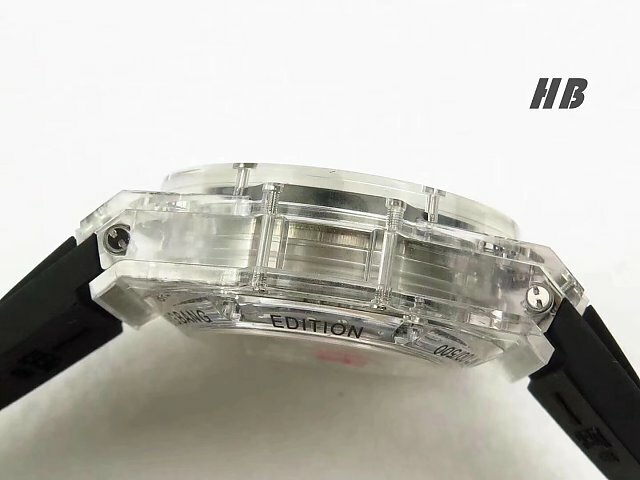 it was so clear to get time information since its dial was ultra big, total has 44.5mm in diameter. 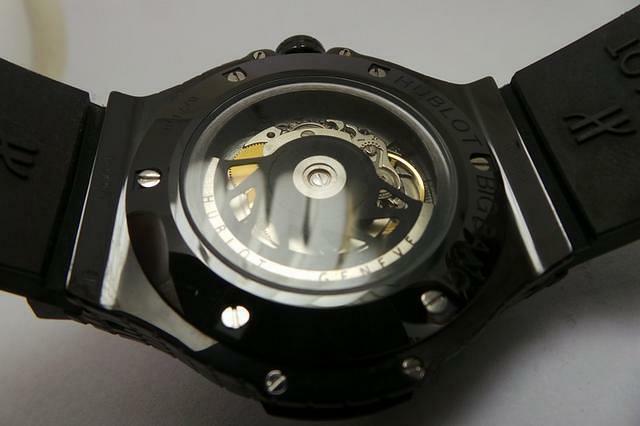 Three sub-dials was set in its dial steadily. 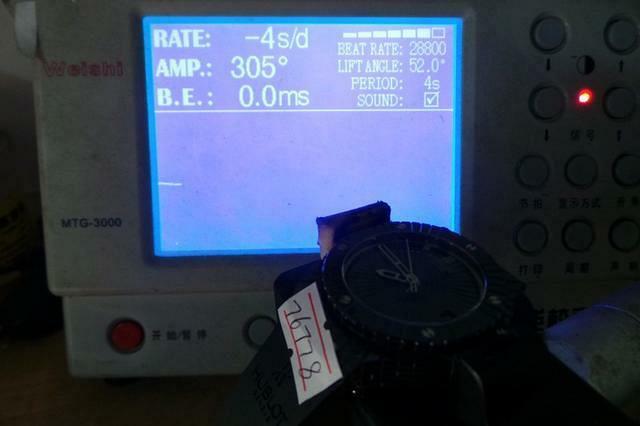 At the 3:00, 6:00, 9:00 position respectively. 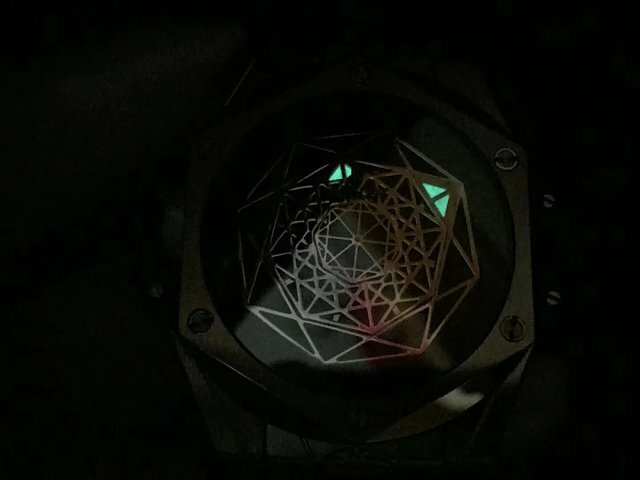 When we see it structure carefully, we may be out of control to appreciate its perfect detail. 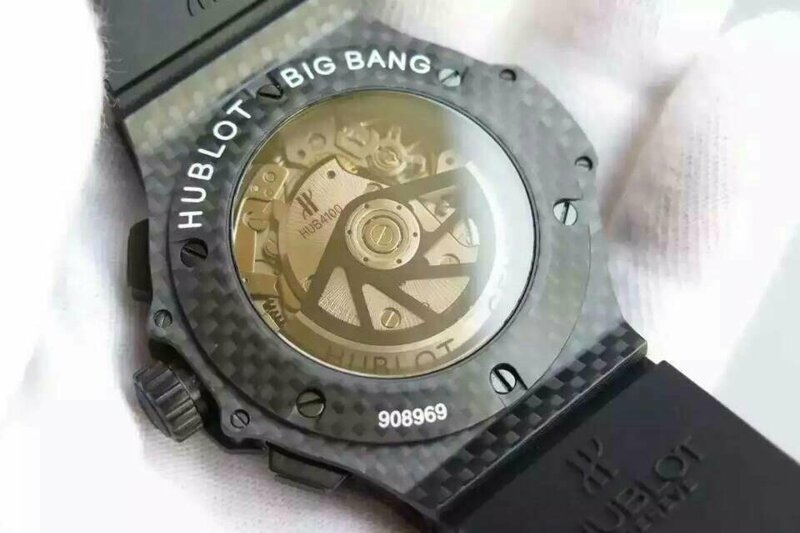 Its crews only has six pieces, which has made it more attractive and give us deep impression, and highlight the stylish characteristic of bezel. And these screws were no only as decorating tool, it was responsible for keep a stable sandwich structure. 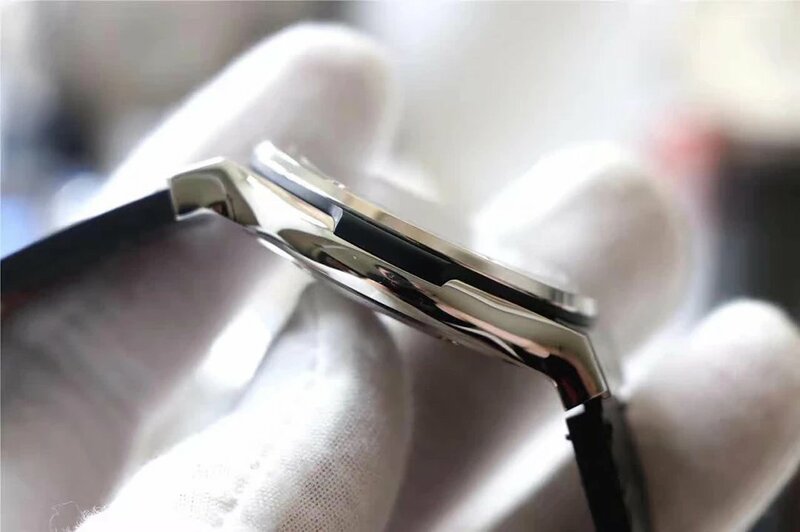 The brushed ceramic bezel has increased its glossiness as a whole. 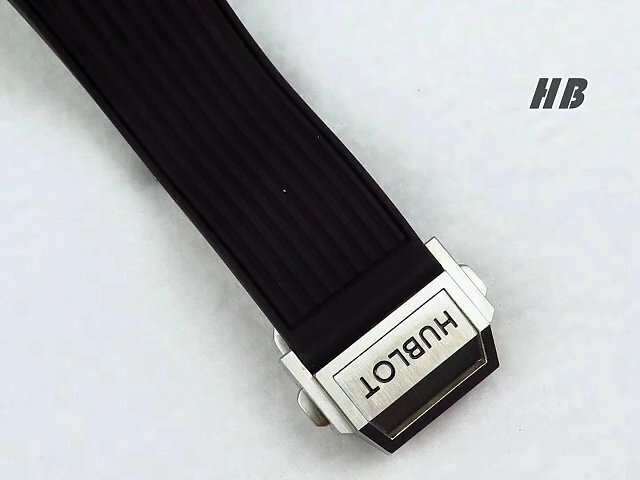 The straight lines was used in design skillfully, which has made this wrist watch with the unique beauty of modern. 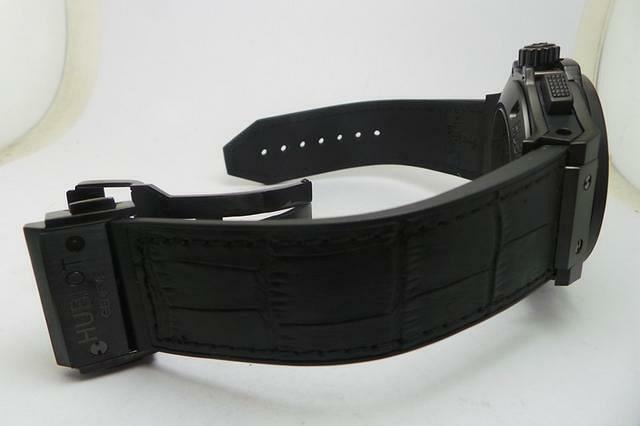 Matching with one black leather strap. On one hand, it was so comfortable, one the other hand, its was full of sport style as a whole. 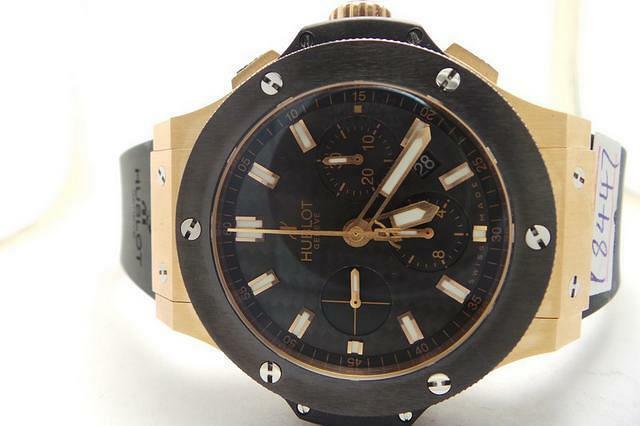 This Hublot Aero Bang replica is equipped with Asian 7750 Valjoux Working Chronograph movement, have ensure can be accurate and stable in travel time. 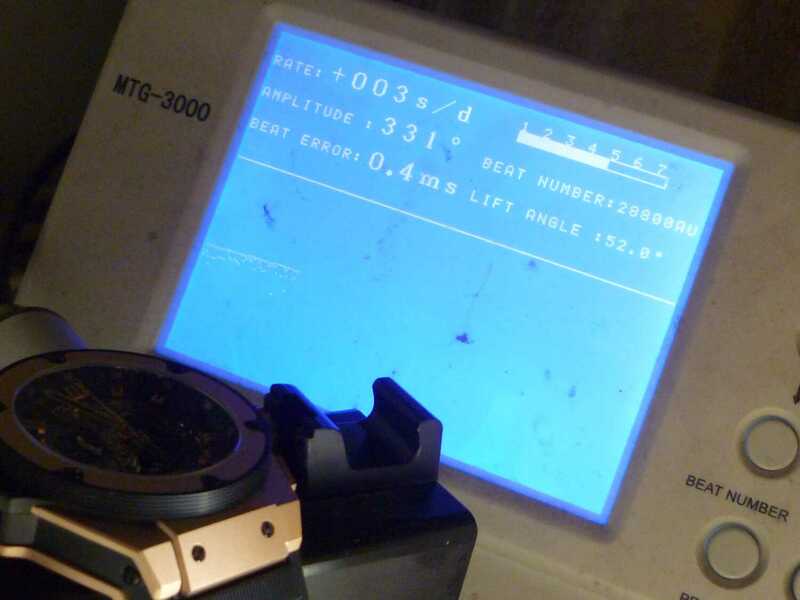 When you need to use its function of chronograph, you can push the buttons to adjust. 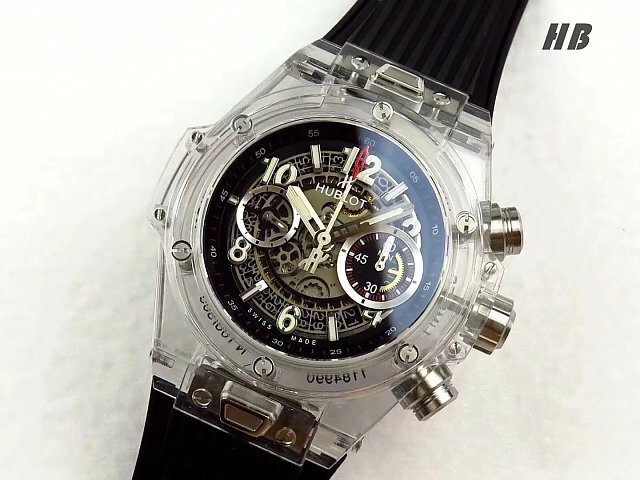 Through its transparent case back, we can admire the beauty of machine. 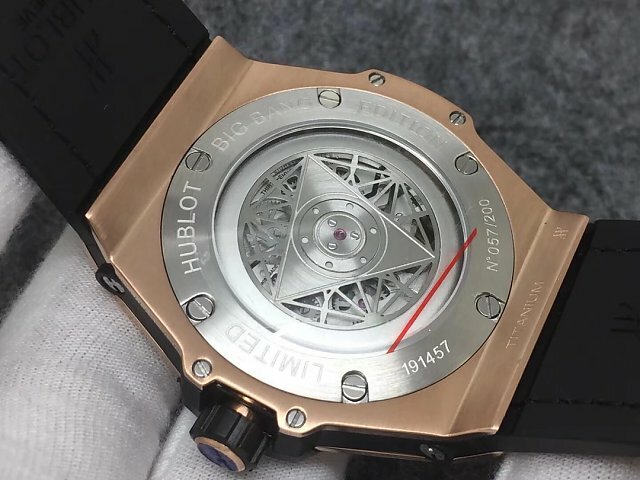 And its has engraved details in case rims as well. 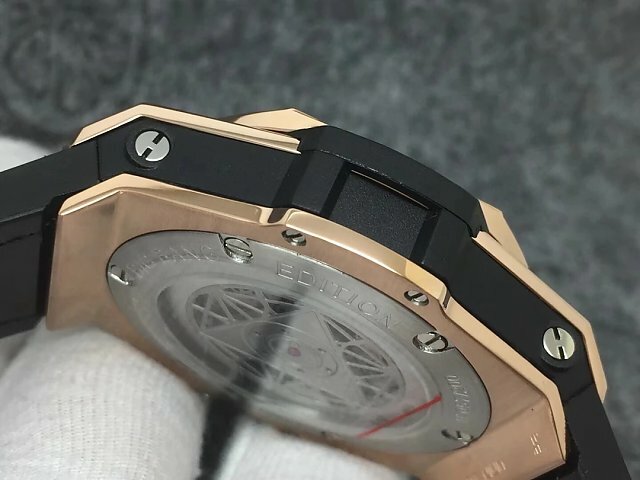 All in all, no matter we judge this replica from its lines, color collocation or material, we may be unforgettable due to its perfect structure and powerful capability. I think it deserve to be one of your partner.